PIMA (grade II), Australian, Pakistani, Indian (Shankar, MCU-5), West African (Burkina Faso), Extra-Long-Staple CIS, Brazilian, and Egyptian GIZA (88, 70), etc. We can supply yarn produced with the above listed cotton qualities. 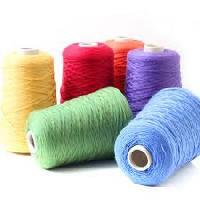 Yarn or Carded Cotton Yarn is available in coarse as well as fine counts, in single, double and also in three ply. Besides these types, high twist carded yarn is also available.